The Korean brand Hanskin claims to be the first brand having released a consumer used BB cream and thus to be the original BB cream creator from Korea. They have a lot of different types of BB creams. The price of their products is in the midrange, so they don’t retail for super affordable prices. The packaging design of their products is simple and mature, kind of elegant, too. The Hanskin Bio Origin BB creams I’m showing you today have a characteristic dark purple color of their packaging. The brand and the name of the product are written on them in simple letters, too. 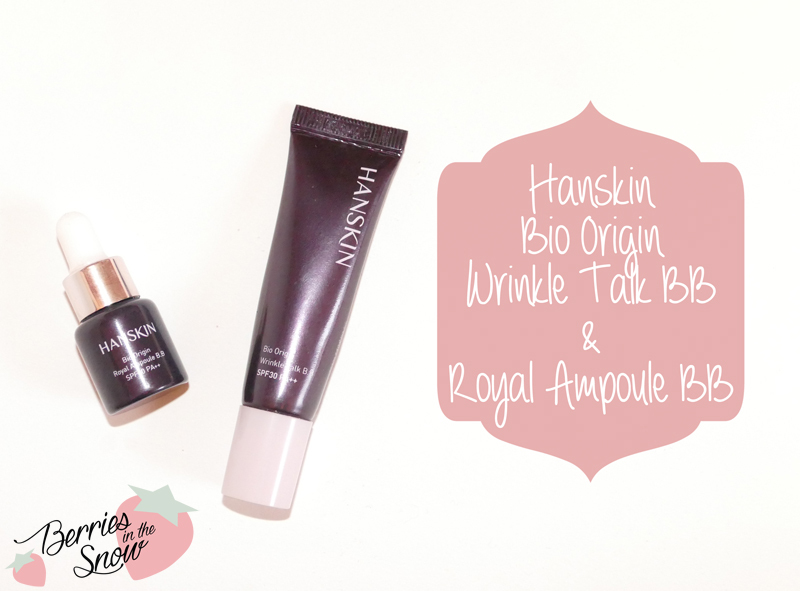 The Hanskin Bio Origin Wrinkle Talk BB cream comes in a regular tube packaging, as most of us are familiar with for BB/CC creams. Unfortunately, it is a simple tube, even for the fullsize and not a pump dispenser, like Missha’s full size BB creams has, for example. The Hanskin Bio Origin Royal Ampoule BB on the other hand comes in a tiny bottle with a pipette attached to the lid. You can use the dropper for taking out the BB cream. This is possible, because the BB cream contains ampoule, making the consistency of the BB cream more liquid. The Hanskin Bio Origin Wrinkle Talk BB cream is supposed to offer wrinkle improvement, brightening and sun protection. It has SPF30 PA++ and contains titanium dioxide and zinc oxide therefore. It also contains hyaluronic acid and hydrolysed collagen as key ingredients for reducing the appearance of wrinkles. The ingredients are listed on COSDNA >>here<<. They are safe to use and no red flagged ingredient is contained. 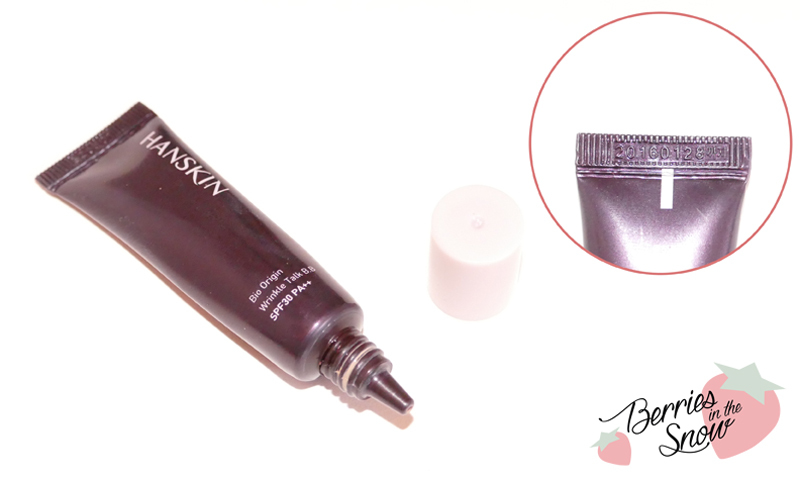 The deluxe sample tube comes with a regular screwing cap and has the expiration date imprinted on the tube. It was sometimes hard to control the amount of BB cream when pressing the tube and I mostly ended up in having a mess all around the winding of the tube and in the inside of the cap. I hope that you don’t have this problem with the fullsized product! 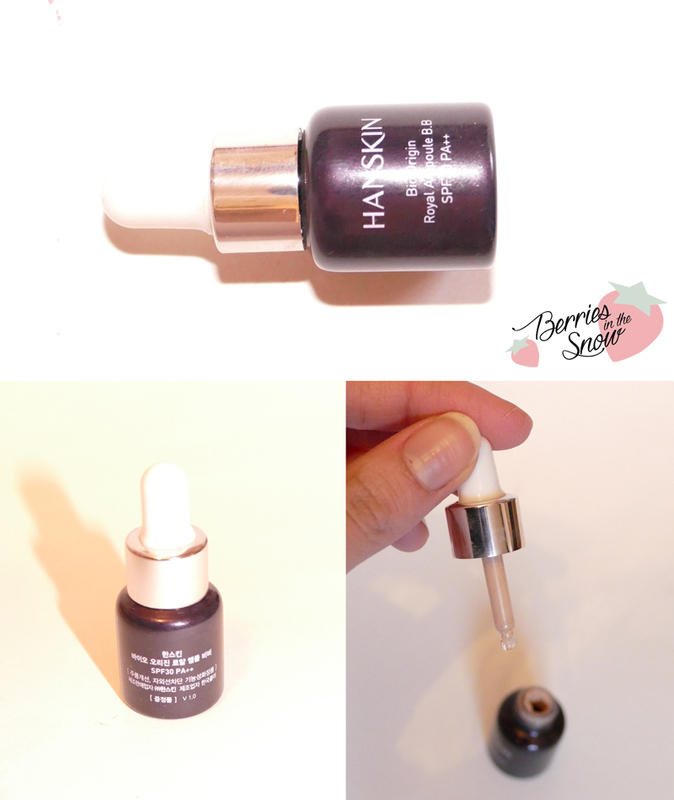 The deluxe sample of the Hanskin Bio Origin Royal Ampoule is really cute on the other hand. I would not have expected them to make a bottle with a dropper for the sample product. However, this gives you an idea on how the fullsized product works. At the beginning, it was very convenient to use the dropper. The BB cream is not totally liquid, so you will have BB cream around the glas part of the pipette, but in general it is easy to use. As soon as the amount of product gets fewer and the bottle is almost empty things get harder. The dropper doesn’t word anymore and you can use it either to get some BB cream out by smearing it against the inside walls of the bottle, or you take a spatula or similar to scarp out the BB cream from the walls of the container. The ingredients of the Royal Ampoule BB cream are listed on COSDNA, too, and also here, there are no red flagged ingredients. The BB cream has SPF 30 PA++ like the Wrinkle Talk BB and it contains also titanium dioxide and zinc oxide. Additionally, it contains ethylhexyl methoxycinnamate for sunprotection.The key ingredients for the Royal Ampoule BB cream are Honey and Royal Jelly Extract. It also contains Hyaluronic acid and some plant extracts for skincare benefits. When we compare the two BB creams swatched on the back of my hand, you can see that the Royal Ampoule BB cream has a lighter shade than the Wrinkle Talk BB cream. Both shades are called natural beige though. The Wrinkle Talk BB cream has a creamy texture and feels thicker upon application compared to the lighter Royal Ampoule BB cream. This makes the Royal Ampoule BB easier to blend into the skin. Since the Royal Ampoule BB cream contains ampoule it tends to get more oily than the wrinkle talk BB cream. In general both have a medium oil control only. The pictures below were taken one hour after applying the BB cream on the blotting paper. Below you can see how both BB creams look when applied on the face. The finish may be a bit hard to see, but the Hanskin Bio Origin Wrinkle Talk BB cream has a more matte finish than the Royal Ampoule BB cream. 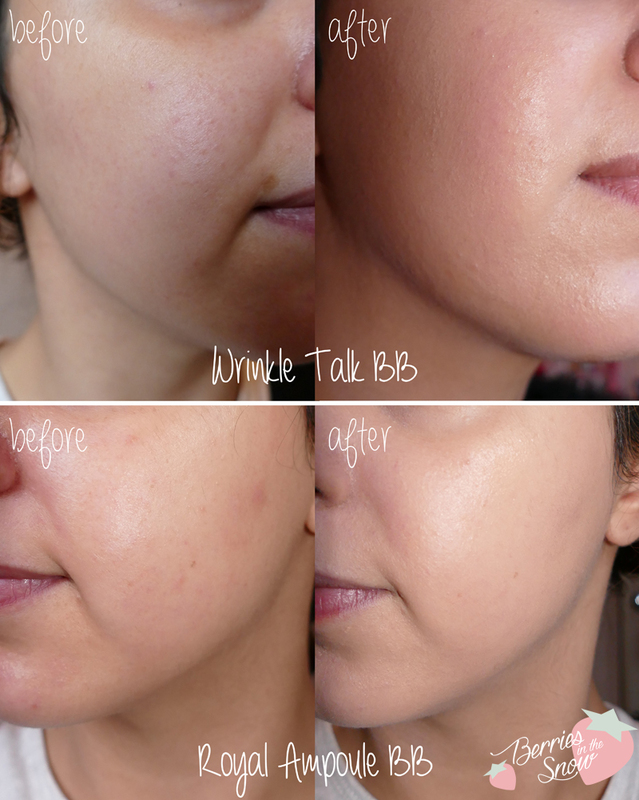 On the other hand, because of the thicker consitency, the Wrinkle Talk BB cream is harder to apply and leaves streaks if you do not blend in properly. Both have medium coverage. 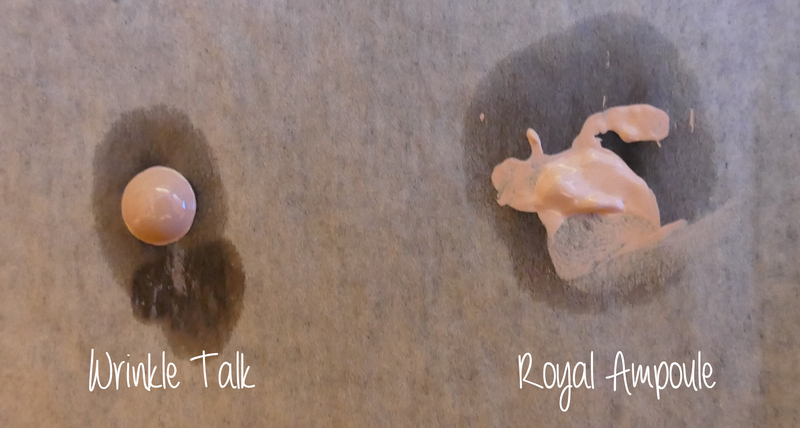 I would say, that the Royal Ampoule BB cream is better suited for layering, because of its texture. All in all, both the Hanskin Bio Origin BB creams are good BB creams. If I would have to decide which of these two I would repurchase I would decide for the Hanskin Bio Origin Royal Ampoule BB, since it didn’t look streaky and was better suited for my (dry) skintype. I also do like the idea of applying a BB cream with a dropper, but I can imagine that the fullsized bottle has the same problem like the deluxe size has. As soon as the product nears to get empty it is hard to use the dropper. The idea of using a BB cream combined with ampoule ingredients is great, and I love the idea, which is why I ordered the Innisfree Ampoule Intense Cushion recently (and I love using it!). In terms of wrinkle improvement like promised by the Hanskin bio Origin Wrinkle Talk BB cream I didn’t notice any visible changes. If you want to try any of these items you can have a look at Koreadepart. I’ve personally never ordered with them, but I know a lot of people do. Both BB creams costs around 35 US$ in fullsize (Wrinkle Talk BB 40 ml, Royal Ampoule 35 ml). Oooo these two look very very interesting! I have a hanskin bb cream that’s a 5ml mini but it’s neither of these and I love it. It’s a more thick and creamy formula and is quite pale in color. I would love to try both of those! I think hanskin makes some really nice bb creams! I agree, I think their BB creams are worth some tries. I will definitively check for this brand in future again.